Police across England made 83 arrests after fans rioted following England's Euro 2004 loss to France. Some 400 people were involved in disturbances in Croydon, south London, where police were pelted with missiles and 13 people were arrested. Another 12 people were arrested in Birmingham after a crowd of 200 caused trouble around the city centre. This was in sharp contrast to the scene in Lisbon, where England supporters remained peaceful. One supporter was reportedly arrested for allegedly punching an employee at the Lisbon stadium. And one was handed a suspended jail term and deported following an earlier attack on a French supporter in Lisbon city centre. Police in Croydon said disturbances there erupted at about 2215 BST on Sunday and continued for about an hour. Two people were taken to hospital and bailed to return to a police station on 16 June, while eleven remain in custody. Two police officers suffered minor injuries and several police vehicles were damaged. Supt Nick Jupp, of Croydon Police, condemned the violence, saying: "It is totally unacceptable for police officers to be injured as a result of a small minority of people reacting to a football result in this manner." In Birmingham, police had to close off parts of Broad Street for 45 minutes after disturbances broke out at about 2150 BST. The violence involved fans who had been watching the match on a big screen in the city's Centenary Square. Damage was caused to several pubs, a bus and various hoardings, while several people played football in the main carriageway of Broad Street which led to the road closure. There were 17 arrests in Wakefield, West Yorkshire, and 31 across Hertfordshire. And a further 11 were held after two police cars were set alight in Boston, Lincs, and a group of up to 60 people threw bricks and bottles at police. By contrast, the atmosphere in Lisbon was relatively muted, with many fans still in shock after losing the match in the final minute. Of the 30,000 England fans thought to have descended on the city, most either gathered in bars to commiserate peacefully or else returned to their lodgings for an early night. The mood contrasted with the scenes on Sunday afternoon before then game, when hordes of expectant red and white-clad fans brought a festival atmosphere as they gathered for the match in venues around Portugal's capital. Even Lisbon's Rossio Square, which had been the focus of celebrations ahead of the game, was unusually quiet in the hours that followed, BBC News Online's Duncan Walker, in Lisbon, said. 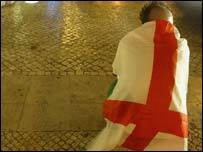 But one England fan was deported from Portugal following an assault on a Frenchman on Saturday. Alan John Walker, 29, from Leek in Staffordshire was given a 12-month suspended sentence and a fine of 2,000 euros at a Portuguese court. He has been banned from returning to Portugal for 12 months. But the mood of most fans following the France game has been more sombre than belligerent. In the Docas nightclub sector on the Lisbon's waterfront, police kept a low-key presence. "So far, so good," one officer said, holding up crossed fingers. Home Secretary David Blunkett, who was at the match, said afterwards: "Like every other supporter I am bitterly disappointed at tonight's result but I am also very proud of the good behaviour of the vast majority of England fans who are in Portugal to see the tournament."